The composer Antonio Salieri (F. Murray Abraham) confesses to murdering Wolfgang Amadeus Mozart (Tom Hulce) and, in penance, attempts to cut his own throat. Confined to a mental asylum, he recounts the story of his rivalry with Mozart to a visiting priest (Richard Frank). Peter Shaffer’s 1979 play Amadeus fictionalised both the life of Mozart and his alleged rivalry with fellow Vienna-based composer Salieri. Initially staged by London’s Royal National Theatre, it won several awards and inspired producer Saul Zaentz to make a feature film adaptation. That film came five years later, reuniting Zaentz with his One Flew Over the Cuckoo’s Nest director Miloš Forman. Much like that earlier, very different film, Amadeus is a movie masterpiece: engaging, beautifully performed and staged, and packed with emotional power. At its centre is a phenomenal performance by F. Murray Abraham as Salieri. In effect Abraham plays two roles. For the bulk of the film he plays Salieri is a man in middle-age: eloquent, cultured and enormously vain. That is framed, however, by Salieri as an old man: wracked with guilt but also a paradoxically gleeful sense of pleasure. Transformed by old-age make-up that still rivals the best ever achieved on screen, Abraham presents Salieri as a conflicted, multi-layered and fascinating protagonist. 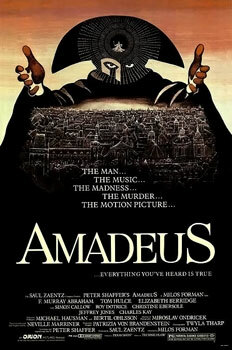 If nothing else Amadeus would be a must-see just to watch Abraham act. He is balanced well by Tom Hulce as Mozart, gifted with a childish humour and the world’s most irritating laugh. He is an elusive character, in which he will occasionally flash with moments of genius and inspiration before returning to the coarse and vulgar buffoon he more regularly appears to be. Hulce gets to the core of the character, carefully teasing out the tragedy beneath the screeching laughter. The supporting cast are uniformly strong, but it is worth singling out both Jeffrey Jones as the Emperor Joseph II and Elizabeth Berridge as Mozart’s devoted and increasingly impatient wife Constanze. Both make a real impact in a film that could easily be overwhelmed by its two leads. The costume and set design are impeccable, while Prague does a pitch-perfect job of standing in for 18th century Vienna. The scenes of the Viennese opera are beautifully staged and performed. The film is long (161 minutes in theatres and a full three hours in Forman’s subsequent director’s cut) but it earns that length with a well-developed story and a strong dramatic build-up from Mozart’s arrival to his untimely end. The real achievement is Amadeus’ use of Mozart’s own music. It works as score of course, but in certain times it works to reveal the mind of the musical composer. Amadeus does not simply recount the life of Mozart; it actually gives an insight into why he remains such a highly regarded figure in classical music history. A late scene of Mozart composing his famous requiem, with Salieri struggling to write it all down in musical notation, is a stunning moment. It is to a large extent simply a scene of two educated men talking shop, but it is presented in a rivetting manner. Forman does a superb job adapting Shaffer’s play. It is a rare adaptation that does not stray far from the original text, yet never feels restrained or static like many play adaptations do. A lot of that comes down to the strength and versatility of Shaffer’s original playscript – and of course Shaffer adapted the play himself – but there is also a tremendously strong and purposeful directorial hand at work. The end results are, quite simply, remarkable. Hulce is brilliant, but I would have loved to have seen what Mark Hamill could do with the role, as he did in the play.